.Construction of the third nuclear-powered and second Nimitz-class aircraft carrier, USS Dwight D. Eisenhower (CVN-69) was authorized by Congress in fiscal year 1970. The carrier, named after the nation's 34th president, was christened at 11:11 a. m., Oct. 11, 1975, by Mrs. Mamie Doud-Eisenhower, the ship's sponsor and widow of the late president. IKE was commissioned on Oct. 18, 1977, under the command of Capt. William E. Ramsey, USN, and assigned to the Atlantic Fleet. After 14 months of fleet training, IKE set sail for her first Mediterranean deployment. Since that time, IKE has completed eight Mediterranean deployments. In 1980, IKE's second extended deployment tallied 254 days at sea with only a five-day stopover in Singapore. After its fourth deployment IKE sailed into Newport News and Drydock in October 1985 for a complex overhaul. The 18-month yard period included the addition of the Close-in Weapons System, NATO Seasparrow Missile System, Navy Tactical Data System, Anti-Submarine Warfare module, communications upgrades and rehabilitation of 1,831 berths in 25 compartments. IKE re-entered the fleet in April 1987. In 1990, IKE completed its sixth Mediterranean Sea deployment. The deployment became a commemorative event in the worldwide 'Dwight D. Eisenhower Centennial,' celebrating the 100th anniversary of the late president's birth. During D-Day anniversary ceremonies off the coast of Normandy, IKE's son, John Eisenhower, and D-Day veterans embarked in the ship while Carrier Air Wing Seven conducted a memorial flyover of the American cemetery at Ohmaha Beach. After completion of an extensive shipyard period and work ups, IKE deployed Sept. 26, 1991 to the Arabian Gulf to continue multi-national operations with coalition forces in support of Operation Desert Storm. IKE returned to Norfolk April 2, 1992. On Jan. 6, 1993, IKE entered Norfolk Naval Shipyard for overhaul and conversion, and returned to the fleet November 12, 1993. In September 1994, IKE and the U. S. Army 10th Mountain Division again made history with the concept of "adaptive force packaging." The division's soldiers and equipment were loaded on board, and the IKE Army and Navy team headed for Port-au-Prince to spearhead Operation Uphold Democracy, the U. S. - led effort to restore he democratically elected government of Haiti. One month later, in October 1994, IKE departed for a six-month deployment which included flying missions in support of Operations Southern Watch and Deny Flight. This deployment marked the firstT ime that women had deployed as crewmembers of a U. S. Navy combatant. The IKE, Carrier Wing Three, and COMCRUDESGRU Eight team included more than 400 women. IKE returned to Newport News Shipbuilding on July 17, 1995, for an 18-month complex overhaul which was completed on Jan. 27, 1997. The ship departed on its 10th deployment on June 10,1998 and returned in December. In February 1999, IKE returned to the Norfolk Navy Shipyard for a six-month refitting and returned to the fleet in June. Upon completion in June 1999, she returned to full duty in the fleet. F/A-18E/F Super Hornet parked on the flight deck of USS Dwight D. Eisenhower, as the ship operates in the Arabian Sea, December 2006. On 3 October 2006 with Carrier Air Wing 7 (CVW-7), Eisenhower returned to sea as the flagship of Rear Admiral Allen G. Myers, commanding Carrier Strike Group 8. CSG-8 also includes the guided-missile cruiser USS Anzio (CG-68), guided-missile destroyers Ramage (DDG-61) and Mason (DDG-87), and the fast-attack submarine Newport News (SSN-750). She visited Naples, Italy and then Limassol, Cyprus for three days in October 2006 before departing to the east. She entered the Persian Gulf in December 2006. On 8 January 2007, a US AC-130 gunship based out of Djibouti was dispatched to target Al-Qaeda operatives located in Somalia. Eisenhower "was deployed in the Indian Ocean to provide air cover for the operation and, if needed, to evacuate downed airmen and other casualties." It joined other US and allied vessels from Bahrain-based Combined Task Force 150 The US spokesperson did not say what particular ships comprised the cordon, but the task force includes vessels from Canada, France, Germany, Pakistan, the UK and the US. US ships of Combined Task Force 150 include the Arleigh Burke-class destroyer USS Ramage (DDG-61) and the Ticonderoga-class cruiser USS Bunker Hill (CG-52). The aim of the patrols is to "... stop SICC leaders or foreign militant supporters escaping" Somalia. In March 2007, following the Iranian seizure of Royal Navy personnel, Eisenhower began battle group exercises off the Iranian coastline. 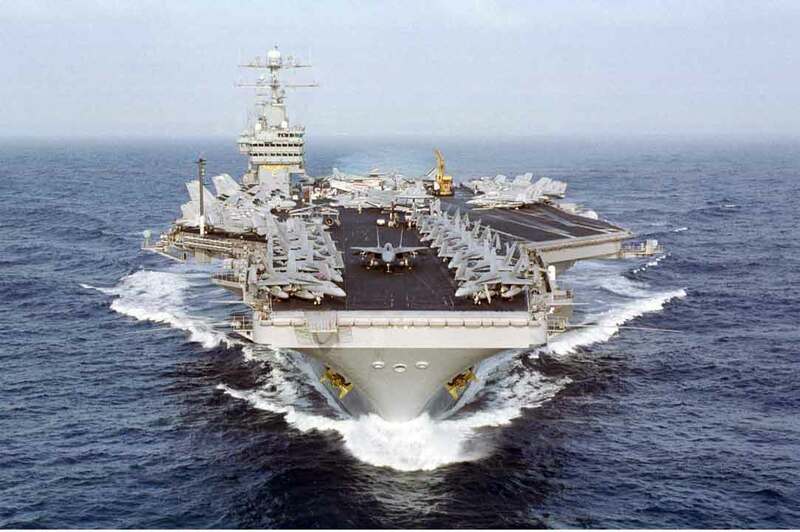 In April 2007, the ship was relieved by the USS Nimitz. A French Dassault Rafale fighter aircraft conducts touch and go landings aboard the Eisenhower during a coalition training exercise. On 4 October 2008 Eisenhower sailor Robert Lemar Robinson was killed on the ship during training exercises off the coast of North Carolina. The sailor was killed after being struck by an airplane at 8:15 p. m. on the carrier's flight deck. On 21 February 2009, Eisenhower deployed for the Arabian Sea and environs rotating into the forward-deployed forces there. She served as the flagship of Carrier Strike Group 8 commanded by Rear Admiral Kurt W. Tidd. Also embarked were Carrier Air Wing 7 and the staff of Commander, Destroyer Squadron 28. Other ships of Strike Group 8 were USS Bainbridge (DDG-96), USS Halyburton (FFG-40), USS Scranton (SSN-756), USS Vicksburg (CG-69), and USS Gettysburg (CG-64). In addition to supporting Operations Iraqi Freedom and Enduring Freedom, the strike group conducted maritime security operations including anti-piracy operations. On 16 May, Eisenhower became the first Nimitz-class carrier to dock pierside in Manama, Bahrain. The last carrier to moor pierside in Bahrain was USS Rendova (CVE-114) in 1948. On 30 July 2009, the Eisenhower returned to Naval Station Norfolk after almost a six month deployment. On 2 January 2010, Eisenhower again deployed to the Middle East, the U. S. 5th and 6th Fleet areas of operations. She again serves as the flagship of Dwight D. Eisenhower Carrier Strike Group commanded by Rear Admiral Philip S. Davidson. While in theater, the strike group provides security cooperation, forward naval presence, maritime security, and crisis response. In addition to the "Ike," the strike group is made up of Carrier Air Wing 7; Commander, Destroyer Squadron 28; the guided-missile cruiser USS Hue City; and guided-missile destroyers USS McFaul, USS Carney, and USS Farragut (DDG-99).